Black_11_12_x_14_12_Envelopes is rated 3.5 out of 5 by 2. Rated 4 out of 5 by Illustrationist from Very high quality, beautiful envelopes I bought three styles of envelopes and all were of impeccable quality. The only reason I give 4 vs 5 stars is that one style is smaller than stated however and will not work for its intended purpose. I have ordered from JAM a total of 3 times (4 different envelopes) and have to say that it really is the best quality of any other company. As an artist I need an envelope that showcases my designs and matches the effort and craftsmanship of my drawings and JAM has proven that they are the only company who can truly produce the level of “Wow” factor that I aim for. They have quite an inventory too so finding colors and sizes that match your needs is pretty easy. As I said, one size ordered was smaller than what I needed and was mislabeled but it’s still a wonderful envelope and I can use it for other projects. Can you print logo on the envelope? Did you know that Sirius Black has used this black envelope before? Instead of those Harry Potter mailers that scream in your face, he found this envelope to be more productive. The massive size along with its strength reminded him so much of Hagrid that he had to get it. J.K. Rowling doesn't like to talk about this because it kind of diminishes the power of magic, but once Voldemort tried to use the killing curse on Sirius and Sirius didn't die because of this envelope. It was so strong that it shielded him from Voldemort's powers. (Of course he didn't have this envelope later on when he does die, but that's another story - the fifth book to be exact). 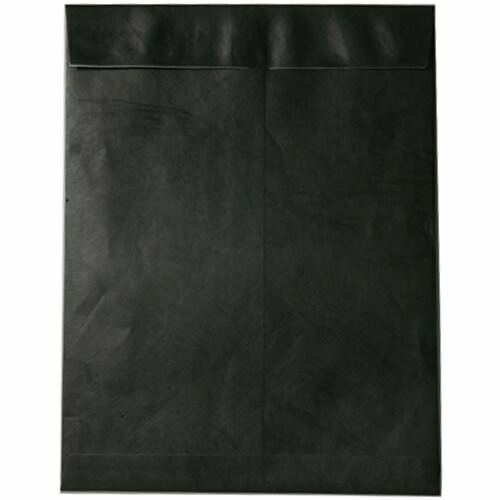 Black Tyvek® Envelopes are water-resistant, tear-proof and lightweight. So flying on that brook will be easy even with this envelope under your arm. They have a peel and seal adhesive on the short side of the envelope that guarantees fast closure for those quick breakaways during that Quidditch match.